Finally the new edition of CAT is here with registration beginning this week. With every edition, IIMs have proven to throw in new challenges and it isn’t any different this year. They have introduced new experimentation this year too. Since CAT has historically been an exam more of time than knowledge, candidate need to orient themselves with these changes and adopt these changes into their preparations. So here is a gist of changes that have been introduced along with what could be potential implications for the candidates. Increased Duration – Increase of 10 minutes in time duration of exam from 170 to 180 minutes. So what does it mean for the candidates? Candidates need to assess how this would impact their preparations to remain competitive in the exam and to leverage the available options in most effective way. Though the exam has increased only marginally in duration, candidates need to be prepared to answer a relatively difficult paper. Now the length has not increased in terms of questions which remain intact at 100, but the level of questions and time taken by each question would definitely increase. This is evident from the fact that IIMs are yielding an extra 10 minutes for same number of questions, especially when there is additional equipment at your hand in form of calculator. Candidate should therefore brace themselves for this challenge. Another challenge that candidates have to prepare for is lack of choice in switching between sections. They would get exactly sixty minutes for each section and cannot move back and forth. Thus candidates who until now relied on their strong sections to score more by devoting more time there would need to re-strategize. Each section now becomes virtually equally important to score and hence the preparations need to be aligned to this need. Increased number of section only slightly worsens this challenge. The most impactful change that has come up is definitely the introduction of calculators. This experiment is going to perplex many candidates by creating an illusion of being a pro-candidate measure. But actually it would prove to be another way to test the candidates of their ability to utilize a tool effectively. While definitely it would help the students save time on those lengthy complex calculations and roots but some could end relying on the tool to the extent of calculating 2+2 (just for sake of confirmation, maybe). This is where these students would lose crucial time, in pressing keys for simple calculations where they could have simply have moved to more questions. Another change that would need some preparation is the introduction of descriptive type questions. CAT notification indicates that some questions may need candidates to type in their answers. This means that you would have to be in practice of typing on the keyboard. For most of us this may seem to be a cakewalk but there would be many from rural or semi-urban areas where computers may not be that common. For such candidates, it would help to get into a bit practice of typing as you do not want to lose those precious moments looking for the right alphabet on the keyboard. 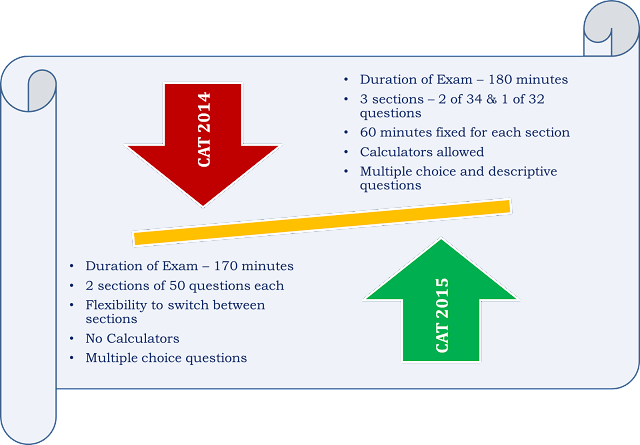 This is a gist of the changes that CAT candidates this year would face and need to be prepared to handle them. Hope this helps you assess the impacts on your current preparations and what changes you may need to incorporate to turn these in your favor. Wishing all of you best for your last leg of preparations!! More strategies and preparation guidelines are available on Bracing to Bell the CAT? Here's some help for you!! Subscribe for the mail feed to receive alerts on more CAT related and other articles coming up on blog very soon. In case you liked this article, share it with your friends on social networks using links below!! If you have any specific questions do post them in comments and I would try to respond as the earliest.